I think we can all agree: life is confusing! Romance is confusing. School is confusing. Waking up in the morning is confusing, especially if you wake up thinking you’re in the X-Men for a solid three minutes (this has happened to me). In recent memory, however, I have never been more confused than when I tried to parse this Goldfish packaging. What is it trying to say, I wonder? There are no less than three separate food entities named on the package. Goldfish. Grahams. S’mores? I stared deeply at this packaging. Cosmic wonders flew past my eyes. My brain grappled, intensely, with the reality of three foods becoming one. Truly, ours is the age of miracles. But philosophy is not the reason we have goldfish. No, we have goldfish to fill our hungry stomachs when there is nothing better in sight. We have goldfish for boredom. We have goldfish to satisfy the grubby fingers of grabby toddlers. True goldfish are wet with mucus. They cry out to an uncaring world as they’re mashed together by developing teeth freshly sprouted from gummy prisons. I, your author, have not consumed any of these mucus-delivery-systems since I opened up a big carton of goldfish and grabbed a dust mite out of the top. This was disappointing and surprising, even though it certainly should not have been. Goldfish have always tasted old and dusty, but actual dust is usually better hidden. I was aghast! Aghast, I say! And yet, my other family members - fools, all of them - cannot get enough of these orange, Ziploc-inhabiting pet effigies. Thus, we find ourselves at our logical conclusion: me, stumbling upon the wondrous packaging at the top of the post in the pantry. I knew immediately. I must consume these. If I don’t, who will, dear reader? But first, I had to open this pandora’s box of snackitude. This was harder than expected. The “Open Here” tab is a sham! A fraud! It does not, in fact open there at all. You want to know what I think? (Yes.) I think Pepperidge Farm was scared. Terrified! Will children and their mothers be able to handle all this? Can we trust America with this? The answer, of course, is that you cannot trust America with anything. And yet! Inevitably, we will wrangle whatever unknowable thing is hidden from us in shadow into the light. Freedom! Like any true American, I can’t follow instructions a lick. All wrong, I say. Instead, I ripped open the top and created a big tear down the middle. This is how I wanted it anyways! That looks much better! Just try to stop me, Family Guy meme company! Now, the heart of the question: “How do they taste?” you ask. Dear reader, you are not ready! No, first you must prepare yourself. It is not time for taste, but observation! “How do they look?” Like this! Finally, goldfish have ended racism. Gaze upon these unthinkable foodstuffs, so happy that their monstrous smiles stretch cruelly into sneers. Why so serious? Can we ever truly know? And in the center, the faceless marshmallow. He is eyeless, but he sees all. Squished, deformed, and disfigured, his tail juts lower than his stomach, creating the crease you see above. Full, magnificent graham cracker tails mock his squishy figure from all sides. Is reality so unkind? 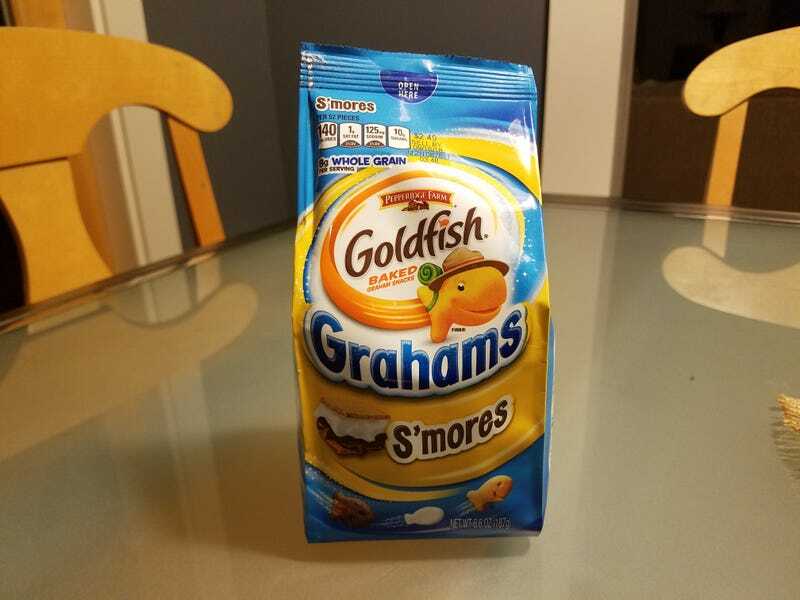 These goldfish are sugary graham crackers. They taste fine. The marshmallow one tastes like lucky charms. They do not taste like s’mores. The cosmos can never be comprehended.